Celtic tattoos are one of the most requested designs worldwide. But this is not because you have fans of Celtic culture in every country but his beautiful and mysterious beauty. The Celtic tattoos have their origin in Irish mythology. Elves, fairies, dragons and fantastic creatures are the stars of incredible love stories you know people of all ages. Celtic designs are often intertwined ribbons giving them a stunning visual aesthetics and other details. The photograph shows a celtic sun tattoo small size. Popularly associated with the sun as a male God, but to the Celtic culture both sun and moon are considered feminine and in fact, are said to be sisters. But in reality this is a totally subjective legend. Evidence has been found that some people saw the sun and moon as feminine and masculine but the truth is that their attributes change depending on the tribe to be taken as reference. Although its meaning is ambiguous in this regard looks good in both men and women for being so simple and clear. The sun in all cultures the sun is the most powerful star and symbolizes strength, fire and light. On the astrology, the sun is synonymous with integrity and truth. The truth is that to decide a sun tattooed on your body is a very self confident. The figure of the image has the tape that characterize and aura fire. 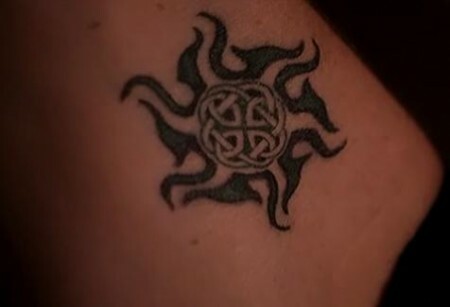 The Celtic tattoos are usually done in black, as loud and bright colors do not look good with this ancient style. Hi buddy, your blog’s design is simple and clean and i like it. Your blog posts are superb. Please keep them coming Sun Tattoos.